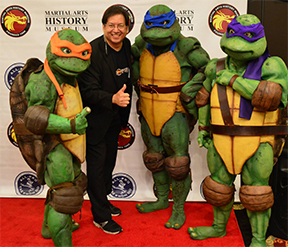 Burbank, CA – Into its twelfth year, the martial arts' biggest convention on the West Coast, Dragonfest, now bursting at the seams, relocates from its long-standing venue in Burbank to the city of Los Angeles. Dragonfest, which is hosted by the Martial Arts History Museum headquartered in Burbank, will be held July 9 at the Airtel Conference Center in Van Nuys, CA. Dragonfest, which was held at the Burbank Holiday Inn for the past several years, is unable to accommodate the growing crowd of spectators so an alternative and much larger location was chosen. “This was not an easy move for us. Burbank is our home and we have held many events at that location and sold out all of their rooms each time. However, our crowds were continuing to grow so we needed to find a bigger place,” notes museum president Michael Matsuda. The new location will enable Dragonfest to install a much larger stage area and this year the expo will include a number of Asian cultural performances featuring the Shaolin Monks, Japanese Taiko Drumming, Chinese music and more. “Having a big stage will enable us to focus more on the theme of the Museum, which is culture and history. I want the expo to have the extra something that even if you are not a martial artist, you will enjoy it,” says Matsuda. The Dragonfest expo is divided into several sections including an Anime/Artist row which will feature Emmy Award winning artists Paul Wee and Christophe Vacher, Jerome Lu, the Kano Kid, Eleazar Del Rosario, Ed Parker Jr., Carol Blaylock and Star Wars/Monkey artist, Jerome Lu. Martial arts celebrities will include the Machete himself, Danny Trejo, Steve Oedekerk of Kung Pow Movie, Robin Shou of Mortal Kombat, Sasha Mitchell, Don “the dragon” Wilson, Carrie Ogawa-Wong of G.I. Joe 2, Cynthia Rothrock, James Lew, Benny Urquidez, Gerald Okamura, Albert Leong, Phillip Rhee of Best of the Best, Ron Thomas and Daryl Vidal of The Karate Kid, Radames Pera of the Kung Fu TV series, T.J. Storm of Conan and more. Martial arts icons will include Art Camacho, Douglas Wong, Graciella Casillas, Fumio Demura, Bill Ryusaki, Cecil Peoples, Simon Rhee, Diana Inosanto, Leo Fong, Tak Kubota, Sol Kaihewalu, Donnie Williams, Malia Dacascos Bernal, to name a few. Kids will also enjoy the many fun booths at Dragonfest including face painting, cosplay characters, the Ninja Turtles and more. In order to attract more children into the convention, entrance for kids under 16 is only $5. “Dragonfest should be a convention for the entire family to enjoy. We have toy booths, cultural booths, and this year, Heritage Books will be joining us,” says Matsuda. “I encourage everyone to attend this event. It has weapons for sale, performances, toys, products, meet celebrities, and so much more. But more importantly, this is our biggest fundraiser for the Museum. 100 percent of everything collected goes to the Museum. This event helps keep the Museum alive and even if you have attended Dragonfest before, come again just to support the Museum,” says Matsuda. Cost of the Dragonest convention is $25, however, early bird price is currently available on their website for only $20 at www.MuseumDragonfest.com. The Airtel Conference Center and Hotel is located at 7277 Valjean Ave. in Van Nuys, right next to the Van Nuys airport. The convention is open July 9 from 11 am to 6 pm, a one-day only event. For information about the Martial Arts History Museum, visit www.MAmuseum.com. The Museum is a non-profit 501(c)(3) organization and donations and memberships are encouraged.